Persistence Market Research analyzes the global LED work light market in a new publication titled “LED Work Light Market: Global Industry Analysis and Forecast, 2016–2024”. This study provides data for 2015 along with a comprehensive forecast for the period 2016–2024. The main objective of the report is to identify dynamics in the market and provide recent updates and insights affecting various segments of the global LED work light market. To provide better understanding of the market, the report also includes an analysis of drivers, restraints, and trends impacting all five assessed regions that influence the current market scenario and future status of the global LED work light market over the forecast period. The report starts with the market overview and provides market definition and taxonomy along with value chain, region-wise pricing analysis, drivers, restraints, and trends in the global LED work light market. The sections that follow include the global LED work light market analysis – by product type, operation, sales channel, end-use, and regional/country level analysis. All the above sections evaluate the global LED work light market on the basis of various factors impacting the market. Each section discusses the qualitative and quantitative aspects of the global LED work light market. To give a brief idea about revenue opportunities from the product type, operation, sales channel, end-use, and region/country-wise segments, the report also provides volume data, absolute $ opportunity, and total incremental opportunity for each segment over the forecast period (2016-2024). In the final section of the report, Persistence Market Research provides company profiles of global LED work light manufacturers and a detailed competition landscape with company market share and performance, to provide report audiences with a dashboard view of key players operating in the global LED work light market along with their business strategies. This section is intended to enable clients to assess strategies deployed by market leaders and help them develop effective strategies accordingly. For market data analysis, the report considers 2015 as the base year, with market numbers estimated for 2016 and a detailed market forecast made for 2017–2024. To calculate the market size, the report considers the weighted average price of LED work light based on product type such as flashlights, spotlights, clamplights, lanterns and others across key geographies. The forecast assesses the total revenue (US$ Mn) as well as volume (units) of the global LED work light market. To deduce market volume size, sales of LED work lights has been considered. In order to provide an accurate forecast, the report starts by sizing up the current market, which forms the basis of how the global LED work light market is expected to develop in the future. Critical market data including the base number and segmental splits has been devised through in-depth secondary research. This data is then triangulated on the basis of different verticals, considering both supply side and demand side drivers and other dynamics of the various regional markets, along with primary interviews of manufacturers and industry experts operating in the global LED work light market. The forecast presented in the report evaluates the actual sales of LED work lights and expected sales in the global LED work light market over the forecast period. The report also analyzes the different segments of the global LED work light market in terms of basis point share (BPS) to understand individual segments’ relative contribution to market growth. This detailed level of information is important for identifying the various key trends governing the global LED work light market. The report also analyzes the global LED work light market based on absolute dollar opportunity. This is usually overlooked while estimating the market forecast. However, from a sales perspective, it is essential to study absolute dollar opportunity to identify potential resources in the global LED work light market. Persistence Market Research has also developed a unique market attractiveness index to understand the key market segments in terms of their performance and growth in the global LED work light market. This market attractiveness index would help clients identify real market opportunities likely to emerge in the global LED work light market. Portable lights that are specifically designed to temporarily illuminate the working area at a residential premise and/or a commercial and industrial workplace and uses LED technology as a source of illumination are defined as LED work lights. There are various type of products commercially available that can be used as a work light namely flashlights, clamplights, spotlights, headlamps and handheld lights. Each type of light serves specific purpose across various industries. For instance, LED head lamps and spotlights are primarily used in automotive garages whereas clamplights are used to perform critical repair operations in homes or electrical workshops. The global LED work light market was valued at nearly US$ 8,000 Mn in 2015 and is anticipated to reach a market value of nearly US$ 10,700 Mn by 2024 end. In terms of value, the global LED work light market is expected to witness an annual growth rate of 3.3% between 2016 and 2024. This growth is primarily driven by the flashlight segment, which accounted for more than 55% market share in 2015. The global LED work light market is primarily driven by the swift penetration of LED technology in portable lighting solutions due to better illumination capabilities. 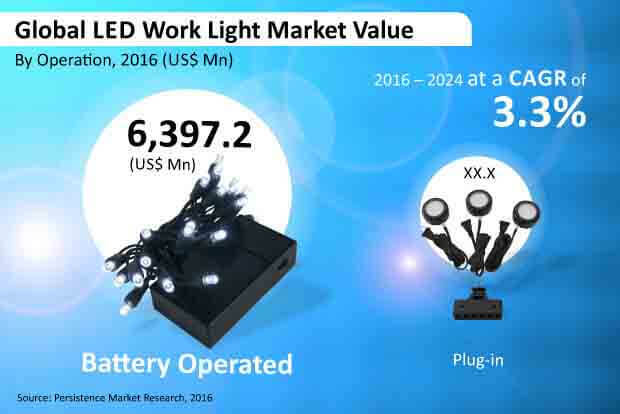 The battery operated segment is expected to dominate the global LED work light market in terms of value and volume throughout the forecast period. The segment is projected to be a relatively attractive as well as lucrative segment in the global LED work light market, registering CAGRs of 4.5% (by volume) and 3.4% (by value) over the forecast period. Battery operated LED work lights are highly preferred for use on account of their property of portability. The plug-in segment is anticipated to lose 50 BPS over the forecast period, as the use of plug-in type of LED work lights is restricted for specific residential, commercial, and industrial applications. The plug-in segment is expected to witness a relatively low Y-o-Y growth rate between 2020 and 2024. The segment was estimated to be valued at nearly US$ 6,400 Mn by 2016 end and is projected to create incremental value opportunity of more than US$ 2,000 Mn between 2016 and 2024. The segment is slated to reach a market valuation of nearly US$ 8,500 Mn by 2024, registering a CAGR of 3.4% during 2016–2024. This segment is primarily driven by consumer expectations for portable and easy to use work light products. This factor is likely to create significant opportunities for manufacturers offering products with features such as long battery life, increased brightness and ergonomic design. This segment was estimated to be valued at nearly US$ 1,800 Mn by 2016 end and is projected to create incremental value opportunity of nearly US$ 550 Mn between 2016 and 2024. The segment is anticipated to be valued at nearly US$ 2,300 Mn by 2024, registering a CAGR of 3.0% over the forecast period. Manufacturers of LED work lights have been focusing on building a fast and more effective sales and distribution infrastructure for their products across geographies. As a part of meeting their objective, work light manufacturers are using online sales channels to help customers buy products. Furthermore, they are providing price incentives for online purchases, and have been stationing their direct business development representatives and agents in various cities to ensure quick product delivery. For instance, companies such as Denmark-based Scangrip are promoting and selling their LED work light products through their online sales and distribution partner, worklightpro.com. Increasing demand for energy efficient work lights offering durability to work in more severe conditions and requiring low maintenance are primarily driving the market for LED work lights. LED work lights are preferred over other work lights as LED work lights offer higher efficiency and longer battery life.